Sooooo, I have a little confession to make. It’s embarrassing so we’ll keep it between us, okay? I recently discovered Luluroe clothing. If you don’t know what it is, stop reading this right now. Do not proceed any further because you do not want to know what I’m about to tell you. Don’t Google it out of curiosity. You know what that did to the cat. If you do know what Luluroe is then that means you may be in the same boat as I am (and that boat is probably sinking because it’s packed from bow to stern with leggings, yeah boat talk). Or maybe you are a much stronger (read: more reasonable) person than I am and you didn’t lose your dang mind over how fun and easy it is to shop via Facebook. Yeah that’s right, I just said shop over Facebook. Your mind is blown, right? If you know that curiosity killed the cat then you may also know that satisfaction brought him back. So I’ll go ahead and try my best to explain everything to you. Luluroe is an online clothing company. Their shtick is that they produce limited quantities of each pattern in every style of clothing. So for example say they make a dress, a skirt, and leggings out of a fabric that has pictures of rolls of toilet paper on them. They will only produce 1,000 items made out of this fabric. This means 333.33333333 dresses, 333.33333333 skirts, and 333.33333333 leggings (I really should have picked an easier number to divide by). It creates artificial demand. Because in the real world not many people are going to buy a dress covered in rolls of toilet paper (that is not a real pattern that I know, but it could be). A Facebook “pop up” is a different story. I’ll explain that term in a minute. You can only buy these clothes from a consultant and most of them do all of their sales online. They will take a picture of each item of clothing and then post them all at one time. Then we, the shoppers, will have to quickly go through all the pictures and see if there is something that we want. If there is we have to be the first person to comment on the photo (“sold”). Since there are A.) No catalogues, so all inventory depends on your consultant B.) Hardly much duplication due to the limited runs of prints and C.) the overwhelming excitement of having to race other people to the print that you want it becomes a bit, addicting. Now, to explain the “pop up”. It’s a temporary group on Facebook where the sales take place. See, that was easy. A consultant will schedule a pop up for (as an example) Monday night at 8PM. She may have thousands of people in her group. As her pictures of the products start coming up all of these people are trying to go through to photos as quickly as they can so that they can be sure to get their top choices. Especially if they are looking for something specific, which most people are. If there is a print that is especially hard to find, it’s called a unicorn. Which is especially frustrating when the one print that you want the most but are having the hardest time finding is one that contains unicorns, but, whatever. So, a few months ago I was introduced into this weird world of shopping. I didn’t really get into it at first. Even after I got my first pair of leggings. 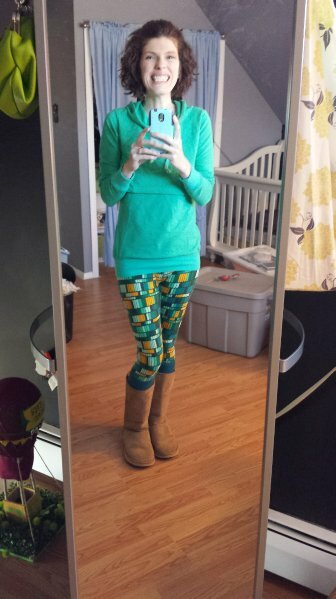 And oh my god were they the most comfortable leggings that I had ever worn. They were soft. They were a really cute print. And they seemed to be hand crafted for me by magicians, they fit me perfectly. I knew that I wanted more but I didn’t really see any styles that I couldn’t live without (I’m still in the process of Konmaring my life so, I don’t really like to bring anything into our house anymore unless I positively can’t live without it). After a while I came across another pair that I liked. They were green, which is kind of my signature color, and they were obnoxious as could be, which is kind of my signature style. Sold. 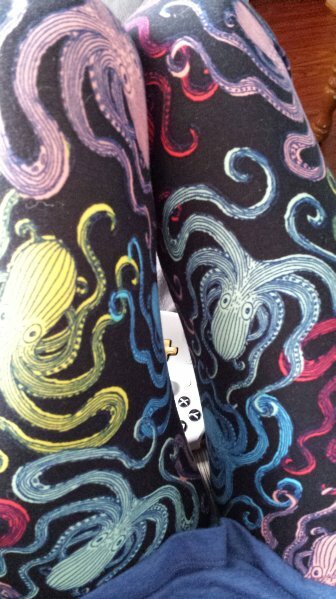 Then I found a pair of black leggings with rainbow of octopi all over them. SOLD! By then I was hooked. I had to see what other exciting colors and patterns there were. This is where the embarrassment starts. I have bees, clouds with suns peeking out, obnoxious patterns, arrows, big foot, giant flowers, cats, even a few solids, just to name some. I also have a dress (which I got for free for hosting a party, along with another pair of leggings, you know, I’m not totally out of control). I’m probably a few hundred dollars into this hole. Which is insane, because they are LEGGINGINS. I belong to about thirty groups online where they hold sales. I check them every time there is a pop up. Sometimes refreshing the screen until my fingers hurt. I’m on the hunt for my unicorns (literally). I justify it all by saying that I don’t really spend money on anything for myself anymore. I also don’t have any clothes that really work for my new lifestyle (you know, the stay-at-somebody-else’s-home-mom thing that I have going on). Or anything that really works for my new body either. I weigh less than I did before I got pregnant so all my bottoms were literally falling off of me (I know, I know, the struggle is real). My husband is cool with it because it makes me happy and because I think he doesn’t really know how much I purchased over the past few months (HUSBAND, STOP READING NOW). I used to get so mad at him when I would see him get a package in the mail that would have a new comic book or action figure or movie. Now I am the one getting little parcels in the mail. I know some day I’m going to have to come clean to him (that day is tomorrow when he reads this, by the way). I just hope that he can forgive me, and remember that I really needed some new clothes. 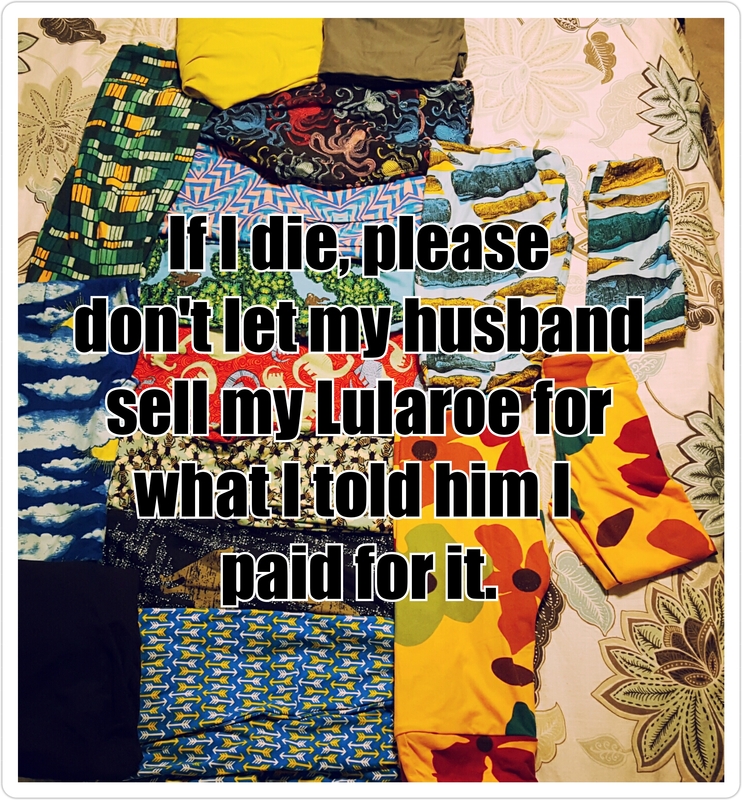 Also, please friends, if I die, don’t let him sell my Lularoe for what I told him I paid for it. Please put it on eBay for him and sell it to the highest bidders. Although I may not have found my literal unicorns, I do have a lot of other people’s figurative unicorns. People are paying three and four times what they cost for these things. Those little ones on the side are matching pairs for my daughter. Yes, I’m that mom. Actually, hold the phone (HUSBAND, YOU CAN COME BACK!!! ), I have an idea. This isn’t an embarrassing addiction, this is a cleaver use of capitol. Imagine what my return on investment is going to be. I have all of these in demand leggings that people are paying four times what I paid for them. I haven’t gone down the rabbit hole, I’ve begun our daughter’s college fund. Oh thank god. I was beginning to think I had a problem.